CNC Digitizing for Milling machines,CENTROID Digitizing touch probe reproduces parts that would be impossible any other way. 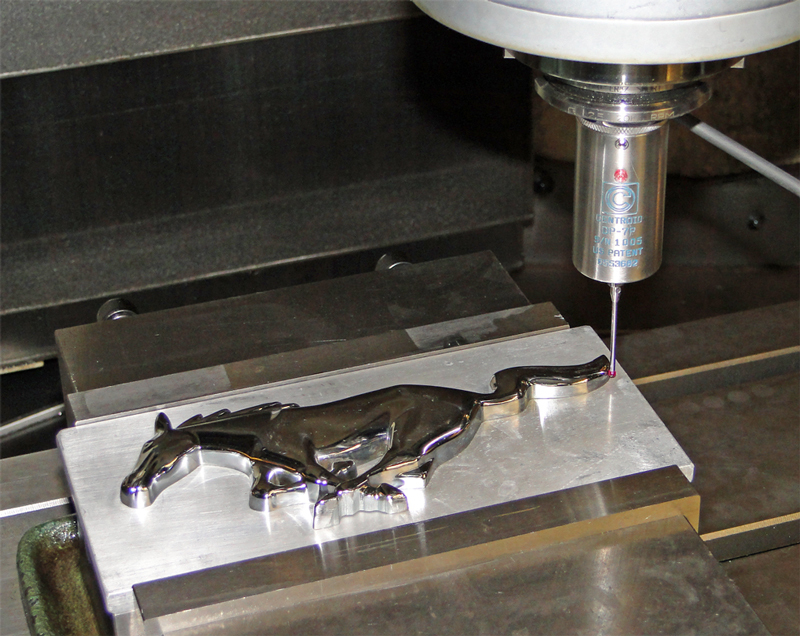 CNC Digitizing: Reproduce existing parts with a milling machine or router. Replicate parts that would be impossible or very difficult any other way. CENTROID's Digitizing will automatically copy any 2D or 3D contour and will automatically create the G code program to machine the reproduction. Great for reproducing machinery Cams, Molds, Plugs, Cylinder head combustion chambers, EDM electrodes, and any free form shape. 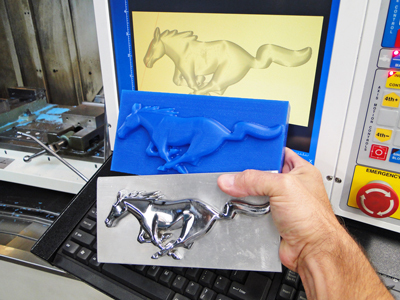 Perfect for Mold and Pattern making, any CENTROID equipped milling machine or router can CNC digitize. Mount the probe in a 1/2" tool holder and install in the spindle, the probe plugs into the control with no setup hassles or RF limitations. In the CNC control menus select the type of digitizing you want and enter in a work envelope size and the resolution you'd like to record and press the cycle start button, the probe automatically traces the surface and records the X,Y,Z positions with no operators attendance needed. Once the digitizing is complete you can immediately machine an exact copy or create roughing and finish passes with most any other CAD/CAM system. Mastercam, Vectric Aspire, Surfcam to name a few. From the bottom of the photo to the top: The original, the reproduced part (in wax) and G code backplot graphics of the digitizing data that was automatically created by CENTROID's CNC Digitizing directly on the milling machine that cut the part. The data you see on the screen is un manipulated raw digitizing data generated by the control, no cad/cam was used in this example. However if more extensive editing to the shape is needed it is easy to export the data to a CAD/CAM system for further editing. Note: Files can be transferred to other centroid equipped machines as well. So you can digitize on one machine and cut the digitized file on multiple machines at the same time for mass production. Digitize and replicate shapes with your CENTROID CNC equipped Milling machine. CENTROID’s Digitizing allows you to use your milling machine or router to automatically copy 2D contours and 3D shapes. Seamlessly integrated into the CENTROID CNC control, digitzing parts is simple with the fill in the blank menus. 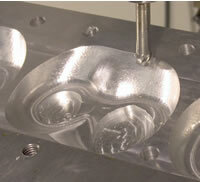 Endless applications for reverse engineering, reproducing Molds, Patterns, Plugs, Cylinder Head work, Machinery Cams, EDM electrodes, and any free form shape. The DP-4 is a mechanical trigger type probe and the DP-7 uses an advanced non-mechanical triggering technology. The DP-4 is suited for all types of probing and digitizing that does not require very long styli. The DP-7 is an ultra accurate probe design that retains is accuracy even with a long styli. The DP-7 is also more accurate (talking tenths here) than the DP4 when using short styli as well. So to make a decision on which probe that fits your type of work; use the DP-4 for all around job shop type work (part and fixture probing, 2D/3D digitizing) and use the DP-7 for 3D/5D digitizing and probing work when ultra fine accuracies are required especially with a long styli. 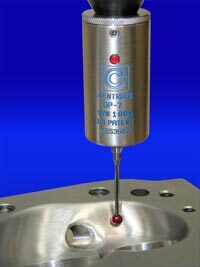 CENTROID manufactures its own touch probes which are more accurate and more reliable that other competing probes on the market. Designed specifically for Digitizing with a milling machine, our probes are so accurate the only limitation is the resolution of the milling machine. Manufactured of stainless steel the DP-4's mechanism requires only a feathers touch to trigger. Unlike other probes, the DP-4's low trigger force allows the use of small styli for maximum detail. The stylus is interchangeable and large selection of different sizes and types of styli are available. The size of styli depends on the size and shape of the object you are copying. Works with both CENTROID's part and fixture Probing cycles and CENTROID Digitizing cycles. DP-4 operator and hookup manual. Includes the DP-4, Probing cycles, Digitizing cycles, Unlimited file size, G code scaling and mirroring, Coordinate System rotation. 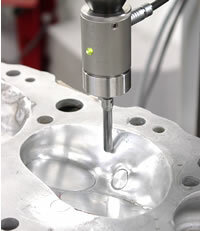 DP-7 touch probe, outperforms mechanical probes with ten times better accuracy while using a 140 mm stylus. Includes the DP-7, Probing cycles, Digitizing cycles, Unlimited file size, G code scaling and mirroring, Coordinate System rotation. Fully integrated into the CNC control, our Digitizing works! CENTROID's Digitizing is seamless with the control the software and is totally integrated into the CNC operating system making CENTROID's CNC digitizing the most user friendly available. With other control systems you'll have to buy software from one company, the probe from yet another company and then an extra PC to connect to the control to run it all. This is an expensive, troublesome way to get the job done. With a CENTROID, we have eliminated all the hassles and difficulties of digitizing with a CNC machine. 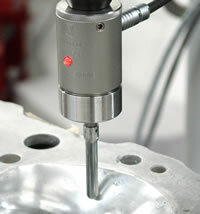 We design and build our own probes and the probing and digitizing cycles within our own CNC software. The CENTROID automatically creates the G-codes as it digitizes. See graphics of the part immediately. No data manipulation is necessary to start cutting, and you can export the digitized part to a CAD/CAM system for further modification if necessary. Powerful features combined with simple operation. To digitize a shape, you need only to describe the approximate length, width, height, and the resolution that you would like to record at, and press start button. CENTROID's digitizing is completely automatic, no operator attendance is required while digitizing. High speed processing, and Unlimited file size are all included, no extra software or computers to purchase to digitize.